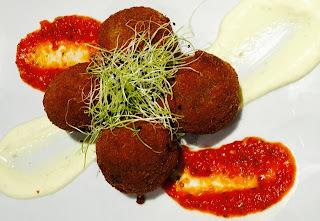 For our next culinary adventure, we found ourselves at Aroma Small Plates & Wine, a modest restaurant nestled in an old Victorian house in Centretown. Specializing in Greek cuisine, Aroma boasts an intimate and casual atmosphere with an extensive, yet moderately priced menu. As evidenced by its name, this Greek eatery features an array of small plates and tapas of authentic and innovative fare, which are best shared amongst a group. When we first arrived, we were kindly greeted by our waitress, who sat us at a round table by the fireplace in the front room. The cozy and familiar setting of the house instantly made us feel welcomed, much like we were attending a friend’s dinner party. As first-timers, our informative waitress explained the menu and suggested ordering between 6 to 8 dishes, a few from each category on the menu. The categories included: The Dips, From the Garden, From the Sea and From the Earth. There was also a dessert category, which was fittingly named Sweet Conclusions. But before making any rash decisions, we perused the elaborate menu and then settled on 7 dishes, which were served sequentially throughout the evening. All of the plates were designed for two people, but could be easily adjusted to accommodate the size of the party. As a group of four, our prices were simply doubled. To begin our meal, we went with two dips: Tzatziki ($5) and Spanikomizithra ($5). 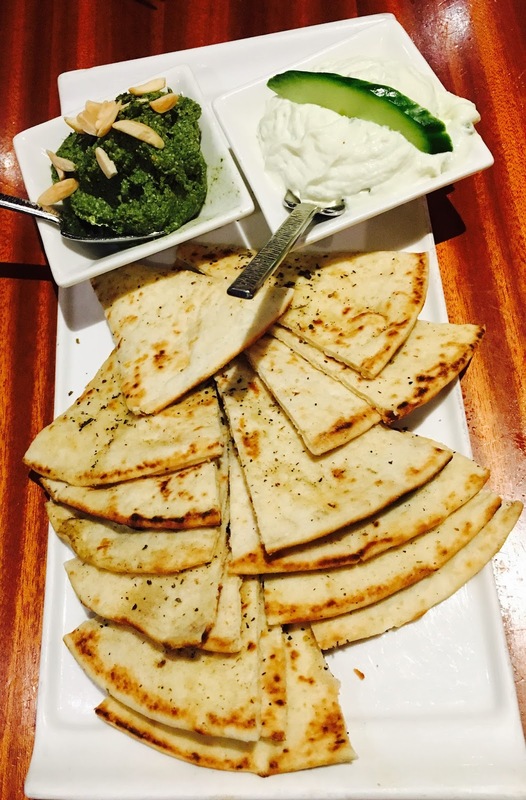 The classic Tzatziki and the Spanikomizithra dip, made of Mizithra cheese, spinach, roasted red peppers, roasted garlic, and almonds, were served with warm pita, which was generously refilled. 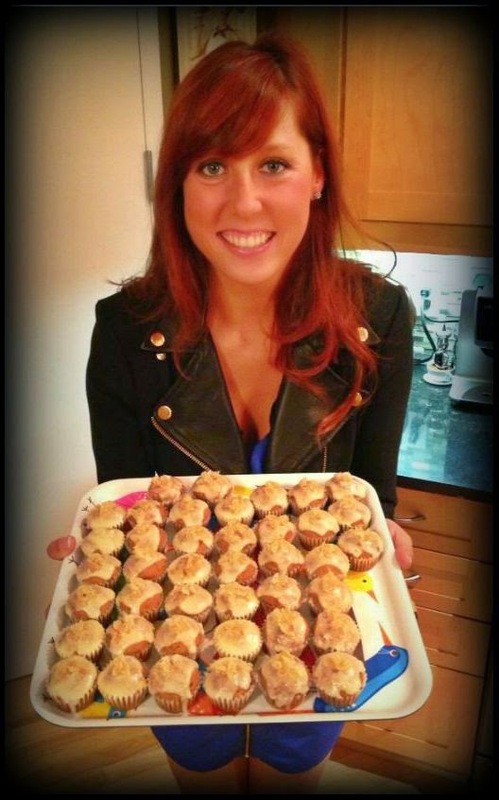 The Spanikomizithra was delicious and a great way to start our culinary experience. 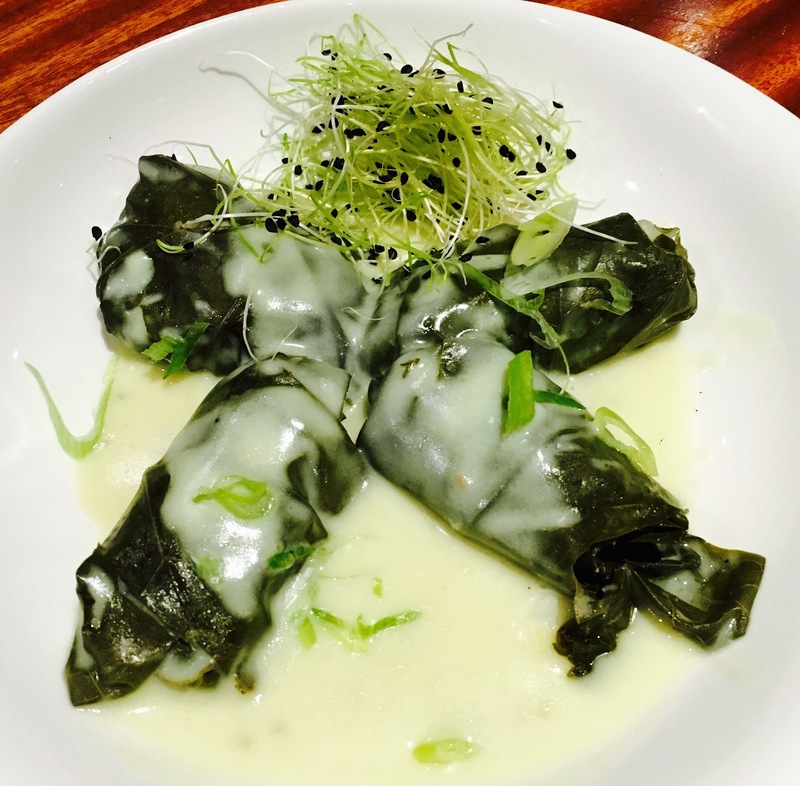 Next up were the Dolmades ($12). Grape leaves stuffed with extra lean halal ground beef, dill, rice and avgolemono sauce were tasty and extremely satisfying. From there, we were served the Arancini ($15), which were Arborio rice balls stuffed with mozzarella and squid ink, and coated in breadcrumbs. While the tomato sauce and zesty aioli accompaniments were tasty, the Arancini missed the mark. They lacked the traditional crispy exterior and were quite sparing on the cheese. Unfortunately, they tasted bland and we were unimpressed. 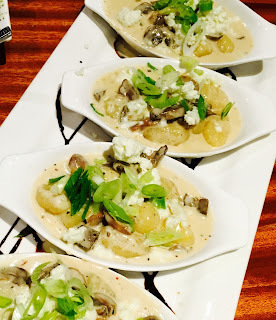 However, our taste buds were delighted with our next dish…the Gorgonzola Gnocchi ($16). Perfectly cooked soft dough dumplings were drizzled in a creamy gorgonzola sauce and topped with wild mushrooms, roasted garlic and goat cheese. We all agreed that this was by far the best dish of the night. The rich flavours and interesting textures skyrocketed this plate to the front of the pack. 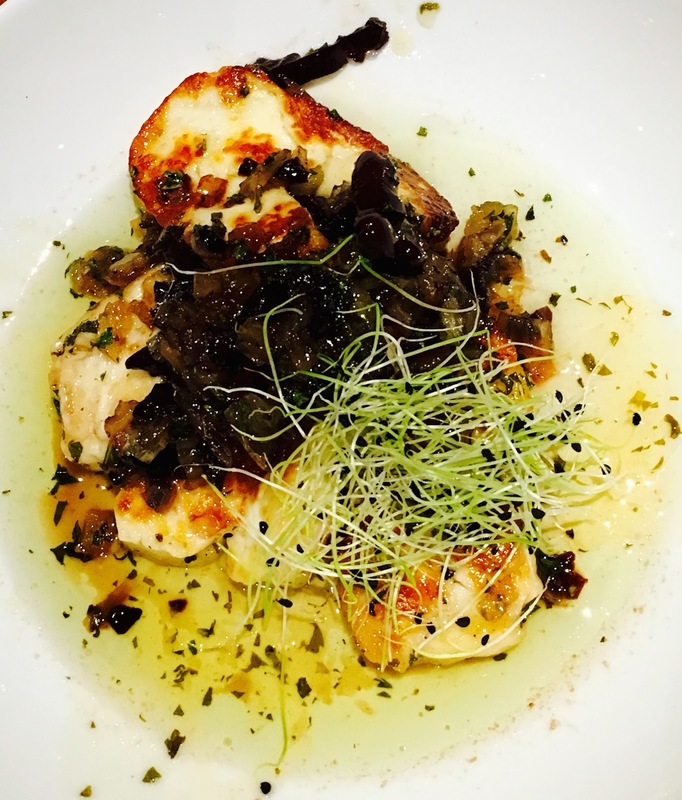 The Gnocchi is definitely a must-try for any Aroma patron. At this point, we were starting to get full, but we had to make room for three more dishes! 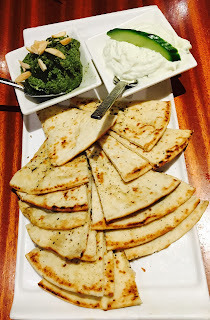 As cheese lovers, our next two dishes featured different types of Greek cheese. First, we were served the Seared Haloumi ($14), a semi-hard brine-cured cheese from Greece. Normally, I absolutely adore Haloumi. I love the distinctive layered texture and subtle flavor of this cheese. However, this time, the toppings ruined it for me. The combination of fennel, onion, mint and honey compote did not work. Luckily, our next cheese plate made up for it. 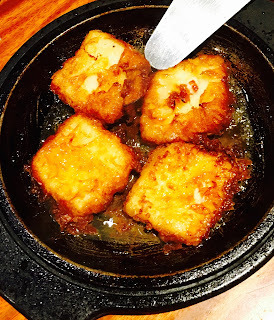 We went with the Saganaki ($14), a pan-seared Greek cheese served in a cast-iron skillet. 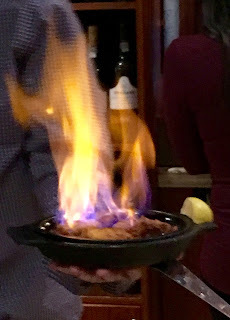 After being fried, the cheese was flambéed at the table, and the flames were then extinguished with a squeeze of fresh lemon juice. The cheese was scrumptious and provided that melt-in-your-mouth sensation. 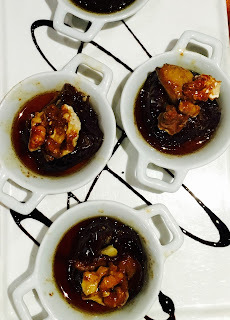 Finally, to finish off the meal, we went with the Madjool Stuffed Dates ($20). Large dates were stuffed with gorgonzola cheese, topped with pan-seared foie gras and deglazed with Marsala and spicy gingered candied walnuts. It was the perfect combination of sweet and salty, and the perfect way to end our Greek feast. Other dishes that passed our table that looked equally delicious include the Fish Tacos, served with coleslaw, tomatoes, coconut, cilantro, lime and jalapeno aioli ($24), and the Beetroot Towers, slow roasted beetroot wheels layered with garlic yogurt and topped with micro greens, roasted chopped walnuts and balsamic reduction ($14). Overall, Aroma left us extremely satisfied; a combination of efficient staff, a relaxing ambience and high-quality Greek cuisine makes for a thoroughly recommendable dining experience.